From the starkly beautiful mountains of Big Bend National Park in West Texas to the moss-draped cypress trees of Caddo Lake in East Texas, the Lone Star State often surprises newcomers with its sheer variety of natural wonders. One factor in the changing landscape across the state is the amount of rain each region receives annually. The deserts of West Texas may get only around 8 inches of rain per year, while the verdant pine forests of East Texas receive about 30 inches of rain annually. The terrain also changes as you travel from west to east, with mountains in the far west, rolling hills in Central Texas and flatlands to the east. Often referred to as the Grand Canyon of Texas, Palo Duro Canyon lies in the state’s northern panhandle. The colorful walls of the canyon reveal 250 million years of geological history. The canyon is 800 feet deep at its lowest point, and it stretches for 120 miles. Throughout the park, you’ll also find bizarre rock formations known as hoodoos, which consist of large rocks perched atop a narrower base. If you’re lucky, you might run across an endangered Texas horned lizard. But don’t get too close. It fends off attackers by spewing blood from its eyes. Located within Big Bend National Park along the border with Mexico, Santa Elena Canyon is a popular spot for rafters. As high, sheer cliffs rise up on either side of the Rio Grande, it feels as if you’re about to enter a whole new world. At the highest point, the cliffs tower 1,500 feet over the Rio Grande. The river can be mild or fast-moving, depending on recent rainfall, so it’s best to ride the river with the help of an experienced guide. When the current is at a medium level, it’s possible to paddle upstream for a few miles and then turn around and let the river do most of the work on the return trip. One of the few natural lakes in Texas, Caddo Lake looks like something out of a slightly dark fairy tale. Long tendrils of Spanish moss hang from cypress trees, and the surface of the lake often appears black due to the dappled sunlight and decaying leaves in the water. As you canoe through the shallow lake, you’ll have to dodge the massive trunks of cypress trees. The marshy environment supports an astonishing variety of wildlife, including alligators, beavers and the pileated woodpecker. The 16-inch-tall pileated woodpecker is often mistaken for another large bird, the ivory-billed woodpecker, which is possibly extinct. Nonetheless, keep your eyes peeled when you hear a loud knocking sound in the middle of the park. A collapsed grotto led to the formation of this natural swimming hole located a few miles southwest of Austin. If recent rainfall has been plentiful, a gorgeous 50-foot waterfall cascades over the side of the former cave wall and meanders through lace-like vines, creating a natural shower for the swimmers below. A short hike is required to get to Hamilton Pool, and there is no lifeguard on duty. In the height of summer, there may be a line to get in. The surrounding 230-acre park is also excellent for hiking. Sharp-eyed visitors might even spot the endangered golden-cheeked warbler. While it’s primarily known as a raucous Spring Break destination, South Padre Island is also home to some of the most beautiful white-sand beaches in the country. Head north on the island and, beyond the resort area, you’ll find miles and miles of unspoiled beaches. In remote areas, you may even spot a massive Kemp’s ridley sea turtle coming ashore to build a nest. Large pods of dolphins frolic just offshore in the calm waters of the Laguna Madre. The whole area is also a birdwatcher’s paradise full of both migrating birds and species that are year-round residents. South Padre is an ideal place to visit in October, when the temperatures are still in the 80s and many hotels offer significant off-season discounts. A massive pink granite dome in the middle of the Texas Hill Country, Enchanted Rock has fascinated people for thousands of years. Native Americans believed the dome had mystical powers, perhaps because of the mysterious sounds that sometimes emanate from it. Scientists now know that the sounds occur due to temperature changes that cause cracks in the rock to expand and contract. Only a short drive away from Austin, the dome makes for a moderately challenging hike. Be sure to wear shoes with good traction. The steep angle can be tricky at times, particularly after rainfall. Though most of the rock appears stark and lifeless, hardy plants and trees do pop up here and there. You can even find tadpoles on occasion in the vernal pools that form in indentations on the rock’s surface. Located a few miles southeast of Amarillo, Caprock Canyons State Park is chock full of all-natural eye candy. Millions of years of geological history can be seen in red, white and orange sedimentary layers in the park’s exposed cliffs. Along the Little Red River, the scenery becomes dotted with cottonwood, wild plum trees and fields of native grasses such as little bluestem and wild rye. A large herd of bison nibbles on those grasses as they lumber around the park. The bison was saved from extinction by a visionary rancher, Charles Goodnight, and generations of hardworking conservationists. In the searing heat of a Texas summer, one of the best places to cool off is deep underground at Natural Bridge Caverns. The Discovery Tour takes you 180 feet below ground where you’ll find a magical world of stalactites, stalagmites and wavy walls known as flowstones. The tour involves a 3/4-mile walk that takes a little over an hour. Located in far West Texas between Midland and El Paso, Guadalupe Mountains National Park is home to one of the most dramatic peaks in Texas: El Capitan. The whole area was once the site of an ancient sea, and many of the rock formations are fossilized reefs. Look closely at the rocks and you can often see the fossilized imprints of ancient algae, sponges and other small sea creatures. Surrounded by lush vegetation, Gorman Falls looks like it belongs in an Amazon rain forest instead of Central Texas. Located within Colorado Bend State Park, the 70-foot waterfall cascades down a hillside and then across a series of step-like boulders. You can often spot Guadalupe bass and other small fish swimming in the small pools that form around the base of the waterfall. While the park is mostly home to small birds such as the black-capped vireo, a few bald eagles have recently been spotted hunting for fish near the waterfall. If you’ve never tried sand surfing, well, now’s your chance. 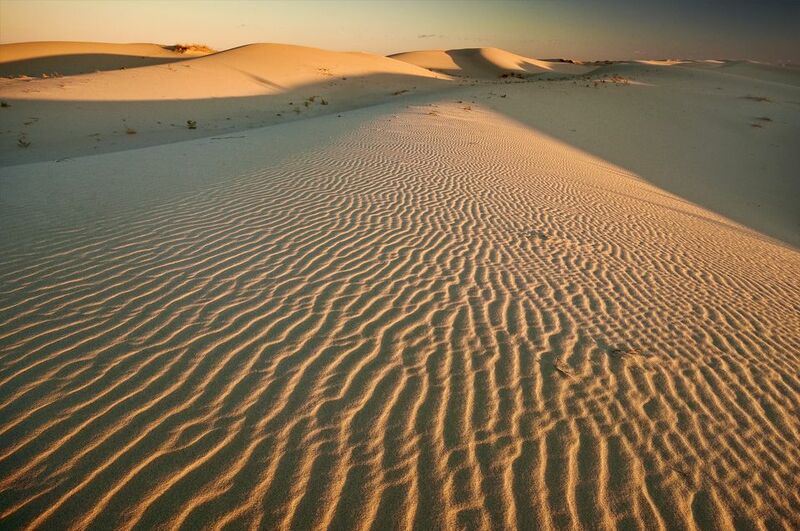 The massive sand dunes at Monahans Sandhills State Park are steep enough to allow for sliding down the hills on plastic “sleds.” Though some of the sand dunes are relatively stationary, held in place by plant roots, others move and change on a regular basis. Occasionally, small waterholes will appear that attract wildlife such as mule deer, bobcats and gray foxes. A stunningly beautiful spring-fed swimming hole west of Austin, Krause Springs (pronounced “krowsee”) is surrounded by towering cypress trees and delicate ferns. There are actually 32 separate springs on the property, which also includes a campground. At the 115-acre campground, you can also go tubing, take a plunge in the creek from a rope swing, stroll through a butterfly garden or hike along several miles of nature trails. At Longhorn Cavern State Park, the temperature in the caves is always cool, but it’s still a little humid. After all, it was water that formed these stunningly beautiful caves over millions of years. Both the flow of water and its ability to gradually dissolve limestone helped create the one-of-a-kind structures in the cavern. Before heading down, you can learn about some of the cave’s more recent history at the visitor’s center. Prehistoric people used the caves for shelter for thousands of years. In the 1800s, European settlers found the cavern and started mining the bat guano inside. Guano (or bat poop) was used to make gunpowder during the Civil War. The standard tour takes about an hour and a half, and you’ll be walking a little over a mile at a slow pace. One of the most fascination formations is the Queen’s Watchdog. It looks like an incomplete sculpture of a dog, complete with four legs. Though it was found deep in the cavern, some have speculated that it may have been carved by early man. Most experts agree, though, that the dog-like shape is just a remarkable coincidence, a result of natural forces over millions of years. Another formation looks like a massive throne. Many of the walls seem to be in motion, featuring curved marks that make the rock look like it’s flowing. Sparkling quartz-like rocks also dot many of the walls. The sheer size of a few of the rooms is astonishing. The area known as the Indian Council Room was big enough to host Comanche tribal meetings. Today, the park occasionally hosts concerts underground, taking advantage of the site’s unique acoustics.